A team of researchers from Michigan State University managed to develop a fully transparent solar panels – a breakthrough that could lead to countless applications in architecture, as well as other fields such as mobile electronics or the automotive industry. Previous attempts to create such a device have been made, but results were never satisfying enough, with low efficiency and poor material quality. The MSU team emphasized on the see-through factor. 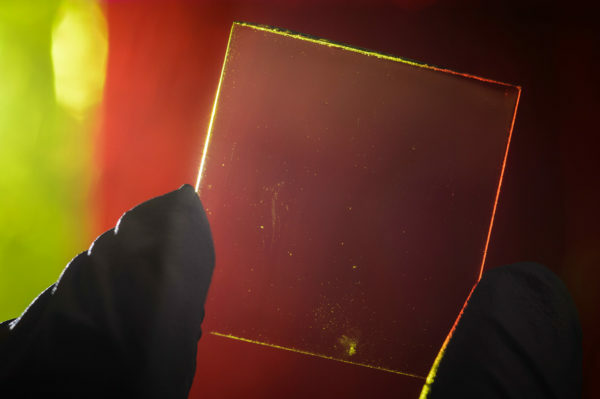 They developed a transparent luminescent solar concentrator, or TLSC, that can be placed over a window or any other clear surface. The concentrator can harvest solar energy without affecting light transmittance. The technology uses organic molecules which absorb wavelengths of light that are invisible to the human eye, like infrared and ultraviolet light. 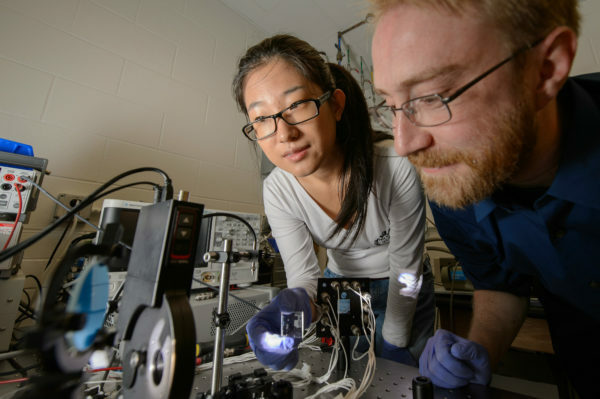 “We can tune these materials to pick up just the ultraviolet and the near infrared wavelengths that then ‘glow’ at another wavelength in the infrared” – Richard Lunt, assistant professor of chemical engineering and materials science at MSU’s College of Engineering. The captured light is transported to the contour of the panel, where it is converted to electricity with the help of thin strips of photovoltaic solar cells. This development would make the most out of the buildings’ facades, since the vertical footprint is often larger than the rooftop one – especially for glass towers. Solar harvesting of Transparent Solar Panels would, thus, become more efficient and aesthetically, without altering the architectural design. Moreover, this technology could be easily integrated in old buildings. Currently the team is working on improving the energy-producing efficiency, that is of 1 % at the moment. The aim is to reach an efficiency beyond 5%. As aforementioned, if developments work, applications would be countless. Members of MSU’s research team include Yimu Zhao, Benjamin Levine and Garrett Meek.